September 2010 - An Opportunity to Celebrate Life! I love this bumper sticker. Maybe it is simply that I love dogs. Or it might be that my own dogs are notorious for living by the wag more, bark less motto. Only recently have I committed to fully living this motto myself. I would not really call myself a barker. However, I do have a reputation of being intense and have been fondly referred to as a pitbull that licks. So even if I am not a regular barker, I don’t believe I wag nearly enough. Sure, I have moments of joy. But to meet and greet by wagging my tail is not my usual. I tend to skip the “Hi, how are you” part of interactions. Also, when upset or deeply concerned about something tend to dive in and cut to the chase. These aren’t always bad qualities. But after spending the past six or seven months helping my boxer puppy, Bailey, learn how to play with all breeds not just boxers, I know I could use some tips. Boxers playing with other boxers are very physical. They go right at each other and there is no need to keep four paws on the ground. I am sure this style of boxing must have something to do with the name. This rough and tough style of play at the dog park and with other breeds sometimes doesn’t make for the best first impressions (or second or third). Bailey had to learn to keep his paws on the ground and make sure other dogs were up for the contact before going all out. He has done well. I love to see him with his boxer buddies playing rough but I am glad he has learned to wag first and bark less with new playmates. In my effort to adapt to a more wag more, bark less lifestyle, I have committed to a few new projects. I have taken on yoga, working to gradually open my shoulders and heart more. I have known for a long time that my body took on a protective stance that served me well early in life. But it isn’t needed anymore. The problem is that character body armor is not easy to take off. Yoga seems to be one path. I like that I am working with someone who knows my bigger picture and story and is tailoring the yoga to fit what I need. I am also committed to more regularly getting feedback from folks that work with me regarding my style. I am committed to finding ways to wag more without withdrawing my passion or watering down my message. Finally, I am working more with my hands, meaning simply making more physical contact. I have always found this easy and rewarding with small children and pets. I am not a touchy type of person with friends and family. I am working on that. I’ve put the bumper sticker on my car. I smile whenever I see it. I doubt I will ever be known as a softy, probably more like my boxer, Bailey, though I think I can learn to play better with all types. In human terms, I think wag more, bark less translates to be more open-hearted and less paranoid. I am willing to work on that! 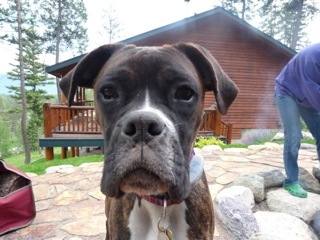 Boxer Bailey with four paws on the ground! This morning I awoke to find my good friend Renée Safrata’s latest Blog/Vlog on The Big Picture, The Shiny Object and The Overwhelmed. It was all about the ‘stuckness’ that can occur when working on great ideas and projects. I loved it. I am someone who suffers from not only the Shiny Object issue but more appropriately the Any Object issue. I often find myself piling on projects. I have one great idea which I start with great motivation and intention. However, it does not take much for me to get distracted. I can use the old ADD disorder excuse, but that does not get any project completed. I liked Renee’s idea of breaking it down into smaller steps and feeding on the adrenal rush of small successes. Like this blog. I wanted to try again to include images into my blog. Some of you got to see pictures of my Super Senior parents in the last blog, but many of you may have missed out because the original posting did not quite work. I had to get technical support to fix the problem. I saw Renee’s vlog today and had the idea to try sharing video this time. I knew the first step was to write my own blog. I got a bit distracted, of course, by other possible subjects and then other images to insert. But I stayed on task. Hopefully you have been able to enjoy learning from Renée’s blog as well. Giving you a chance to identify which one of these trouble spots may slow down your projects! P.S. It took me a week to get this blog completed. I wasn’t able to insert the video quite as easily as I had hoped, and truthfully, I got distracted by another project. At least I remembered and watched the video again. That helped me to get the job done!! Recently my folks were out for a visit. They came via train with my sister Penny and her husband, Rob. I believe this was Penny’s idea and I loved the idea of having everyone out to Montana. I am not sure I would have been willing to board a train for an overnight sleep in coach seats, especially with my parents. I have heard it is not so bad, and they did arrive in excellent spirits. Still, I thought my sister was crazy. Apparently, I was wrong! I had quite a lot to learn about just what’s possible even when traveling as Super Seniors! On the first day of the visit, while Penny and Rob relaxed at The Hay Moon Resort, my folks ventured out with CrisMarie and me to the top of Whitefish Mountain. I went to purchase tickets for the gondola ride to the top, pulling out enough cash to cover tickets for two adults and two seniors. The woman at the window took a look at my folks and asked if either were over 80. They both qualified, my mom, Bernie, is 82 and my Dad, John is 90. He proudly shared this new honor with anyone willing to listen, including the chairlift people, who were more concerned about helping him safely on and off the lift than his Super Senior status. The gondola ride up was soon replaced with the chairlift ride down so my folks could enjoy the fresh air and swing their legs freely. As I spent the next few days with them, I found myself gaining a much greater appreciation for just what a great description Super Seniors is for these two adventuresome people. The next day, we drove up to Logan’s Pass in Glacier National Park. I wasn’t to sure what we would be able to do up there. The trail options were a bit more demanding than I thought my folks could handle. We opted to give the Hidden Lake trail a try. This trail is only 1.5 miles, ascending 800 feet in elevation. It is covered mostly via a boardwalk, however, the boardwalk has no guardrail, and there is a significant incline, meaning there are steps that can be anywhere from the standard 6 inches to a foot and not always level. My folks assured me they would take care of themselves. Of course, I was worried anyway. Penny, CrisMarie and I took off up the trail, with Rob, John and Bernie walking behind. As the gap between us increased, we looked back and could see that we needed to reevaluate the plan. My folks had gone a pretty fair distance from the Visitor Center, but the going was slow, and they realized it wasn’t going to be a trip that was in their best interests to continue. Still, the scenery was amazing. So they wanted to find a rock to sit on and relax. Apparently, they had come prepared with some books and a sketch pad (with only one pencil). We got them settled on some rocks, and off we went. They assured us they’d wait for us to return and we’d help them on the way back. We enjoyed the rest of the hike, seeing some goats and big horn sheep. We were heading back when we realized we’d been a bit longer then we had planned. I took off at a jog to get back to let my folks know we were on our way. As I got back to where I should have been able to see them, I could see they were gone. I started moving much faster. I listened for sirens, looking further ahead for some assistance. When I got back to the Visitor Center, I found my Super Senior folks shopping. They had made their way back just fine. I apologized for taking so long, asking how it had been. They laughed. They had had a grand time. They showed me sketches they had done of each other and of the scenery. When they had gotten tired, they simply asked someone for assistance getting off the rocks and back to the path. Indeed, the stairs going back were a bit more challenging but they had simply taken one step at a time, supporting each other down. Bernie would go down one step supporting John. Then she’d take the next step. Slowly, but very effectively, they worked their way back to the Visitor Center. “We knew we’d be just fine if we helped each other and had no need to get anywhere fast.” I sure wish I applied that wisdom to my life more often, but I guess that’s how they got to be Super Seniors!! Apparently, all my worries were for nothing. My Super Senior parents may look fragile and have to go slower than the average person, but they sure do know how to make the best of their time together. I can only hope that if I make it to Super Senior Status I can live with as much creativity, purpose and adventure as they do! I am on my way to Oakland for our annual two days with my Table Group colleagues. I enjoy these days; however, this time I am coming off an intense weekend of celebrating the birthdays of two of my mentors and the passing of a very dear friend. It seems appropriate to write this blog as a make my way from Gabriola to Oakland via Vancouver and Seattle. My eyes are tired from the tears that flowed today as many old and new friends gathered in the lodge and later in Phoenix to say goodbye to Dianne. My heart is full from Saturday’s birthday celebration of Ben Wong (80) and Maria Gomori (90). Ben is the man behind The Haven and pretty much the sole example about everything I have learned about being human. Maria, (90), is a force of nature who’s life spans everything from wild escapes from death marches in Hungary to career changes that include being a high-level Hungarian political economist, to being a human psychologist in Winnipeg, and a world-traveling facilitator who still runs workshops from early morning to late evening. I wasn’t sure if I was going to be able to make the birthday celebrations. The dates were tricky, and I was already booked before and after. However, when Dianne died and the news spread that there was going to be a ceremony for her on the weekend, I knew I had to come. What was most amazing was the people who gathered. Many were faces from much earlier in my life. People who I hadn’t seen or spoken to in years, all returning because one of these three masters had so deeply touched or transformed their lives that they wanted to come and celebrate. The birthdays were special because on the stage sat 170 years of experience. Jock in his purposeful, strategic way had planned an interview of the pair. He had a vision and with commitment and drama and took us with him. However, I believe in the end, the masters steered us off in other directions: Ben, with his wonderful wit and provocative wisdom, and Maria, with her own agenda to make sure this was really about Ben (and Jock) and just how they had saved her life so many times. I am not sure if things went as Jock imagined, but I believe what he intended was delivered. We all were captured by the stories and the deeper messages about the importance of freedom, integrity and in the end, human connection. The evening was musical, poetic and spanned between the East and the West. It was Haven at its finest. Sunday bought a different flavor to the day. This was a gathering to celebrate not a birthday, but a passing, though this time not quite choreographed, planned and directed. But once we gathered and Dianne’s family joined her extended family of friends, those who agreed to guide the flow of feelings, demonstrated the grace of The Haven in yet another way. Much like a Come Alive, there was just enough structure and thought to bring the day to life. The circle was powerful and a wonderful way for each of us to speak and let our loving of Dianne flow through songs, stories, tears, poems, laughter and hugs. Dianne would have loved it! I didn’t know how important it was for me personally until a young man commented at the tightness in my shoulders. He noticed that my shoulders were slowly rising towards my ears and was willing to check out his story with me. He thought something was wrong. I knew in that moment I was doing what I can do so well, shutting down the feelings and detaching from my heart. His comments were very early in the day and left me with plenty of time to make a different choice. I took a breath because I knew wanted to feel. Now, sitting on the plane, my eyes are quite tired from the many tears I let flow. I am quite full from the weekend and not sure how I will be able to transition to tomorrow’s focus. Right now though, I am full and grateful once again for The Haven, my friends, my family, and all that I learn when I am willing to show up, open my heart, breath and trust.